Irish Pension funds need to look beyond the obvious. Pensions are a time bomb that everybody knows is ticking away but few seem willing to defuse. Most politicians have over the years been happy to hope that when it does explode they will be long gone from the scene, and anyway maybe none of their constituents will be hurt. The recent proposals for mandatory provision are a good idea well grounded in best practice but are they enough? Irish private pension funds have had a good year. This comes on the back of several horrible years. The year was good not just in terms of returns, 27% over the last four years or 6% per annum. It was also good in terms of inflows. This is important as the raid by the government on private pension assets has and had the potential to instill a lack of confidence. Yet we saw an inflow of 11%. 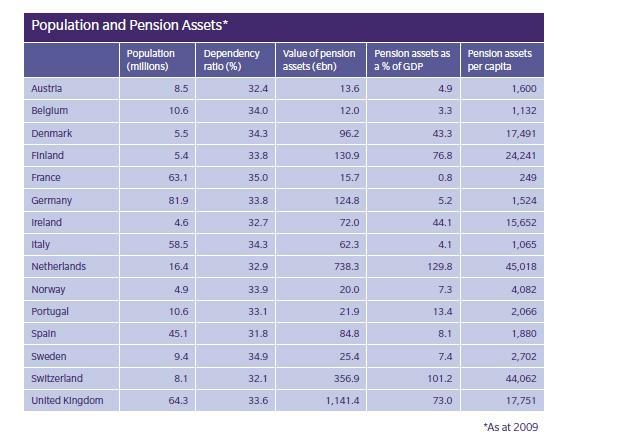 Irish pension funds now stand at just over €80b. This sounds a lot, but it is not really that much. Irish households have on deposit in excess of €90b. In a low interest rate environment where we are and will be for some time to come 80b will not yield much more than 4% pa. This amounts to, gross of tax, about €6400 per person. This is not enough to live on. Thus pension funds need to either up the rate of return they will get or they need to increase the amount of money under management, or both . The recent review of the Irish pension system by the OECD suggests that the private pension industry in Ireland, despite what many feel, is not overly expensive in terms of fees, measured internationally. What is problematic is that it is small. Smaller financial companies can find themselves at a disadvantage. While big is not always better, the efficiency of the pensions industry is probably best enhanced by it growing. To get more returns is problematic. The strong 5-6% growth era of Ireland is over. We have not had that real growth since the mid 1990s and those conditions are not coming back. We have seen how problematic this can be when we chase that growth from credit pumping and / or property ponzi schemes. Thus pension funds that wish to increase growth in the longterm will need to consider thir asset allocation strategy very carefully. If we examine Irish funds against European funds we find some significant differences. 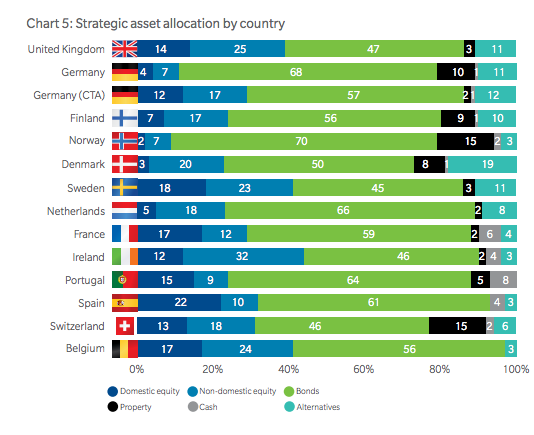 Irish funds tend to have the highest allocation to equities and amongst the lowest to property. This is strange. Although we have been burned by the property crash commercial property should form a solid part of a pension fund. The nature of this asset class is that it is longterm. To some extent this underweighting is a reflection of the cycle we are in but Irish pension investors should consider if 2% is appropriate for the long term. 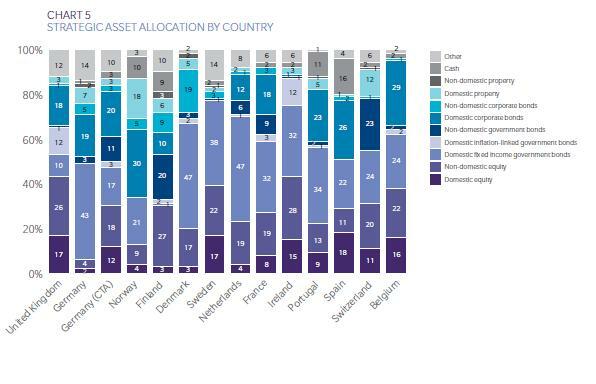 Second, within this heavy equity allocation Irish pension funds are grossly overweight in holdings of domestic equity. They hold 32% of all assets in the form of Irish company shares. The market capitalization of Irish shares is approx. 0.2% of world shares. This overweighting in essence is a gigantic bet on the health of the Irish stock exchange. 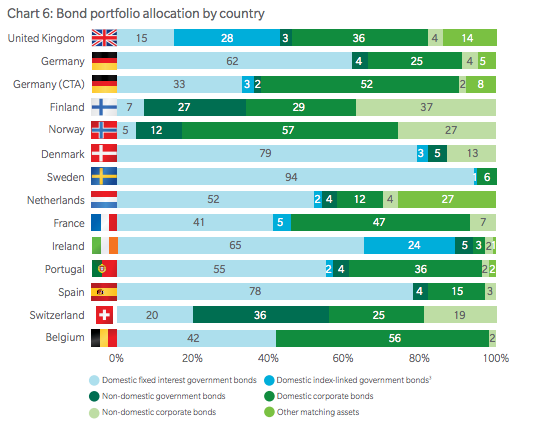 The domestic focus continues on the bond side, where only 5% of bond assets are non domestic government bonds. While Irish government bonds have performed very well over the last couple of years, falling yields being indicative of rising prices, pension fund investment is a longterm investment. It is in the area of alternative investments that we see what is for me the starkest difference. 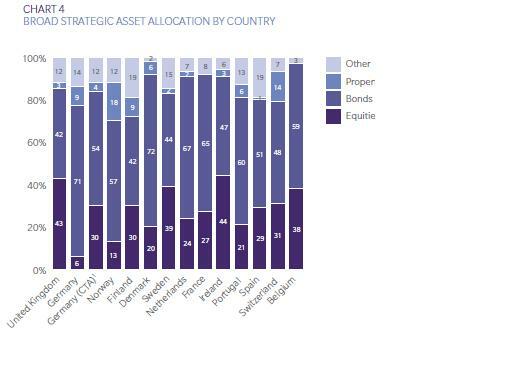 The UK has shown a consistent drift to greater allocation of investments in alternative (to stock and bonds) assets over the past decade, with now 11% of all assets allocated. For Ireland this is 3%. The UK is leading a field in which we are lagging. 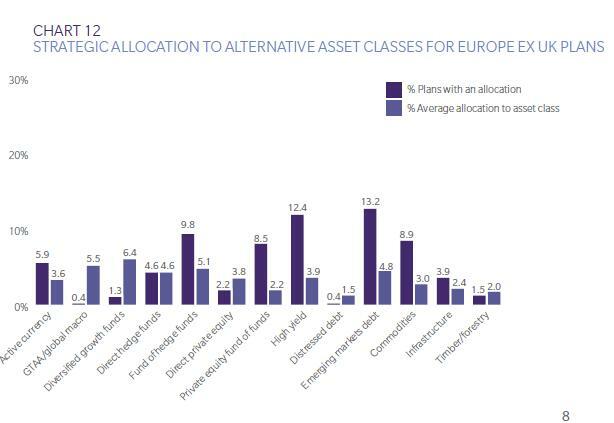 24% of all plans in europe are planning to increase their exposure to alternative investment classes such as gold and private equity. 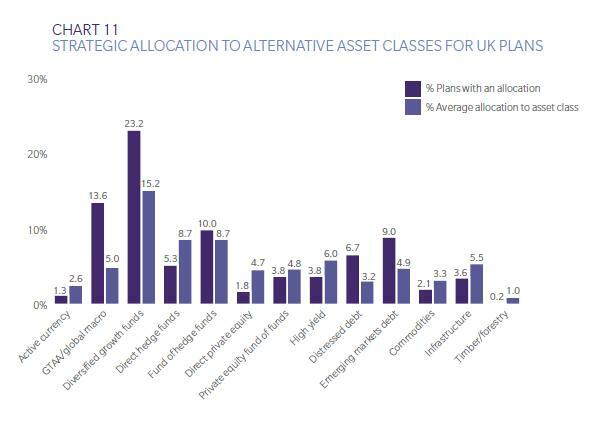 Alternative investments are not an asset class – they are a series of asset classes ranging from emerging market debt to copper futures. The main elements tend to be commercial property, hedge funds, commodities, and classes of debt. Looked at over the last decade or so, certain kinds of alternative investment classes have performed spectacularly well. Amongst the top performers have been global infrastructure funds, commodities especially gold, and global private equity funds. 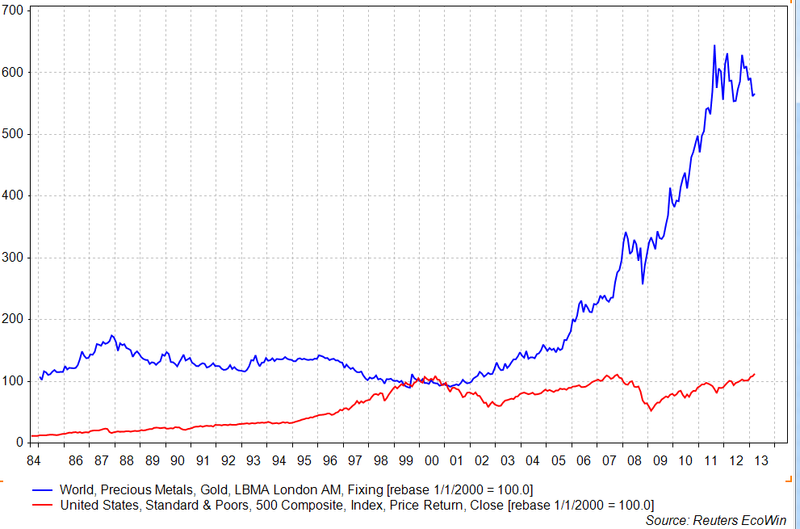 Gold in particular has shown a remarkable sustained growth since 2000, even allowing for an element of froth. So also infrastructure, a trillion dollar market. 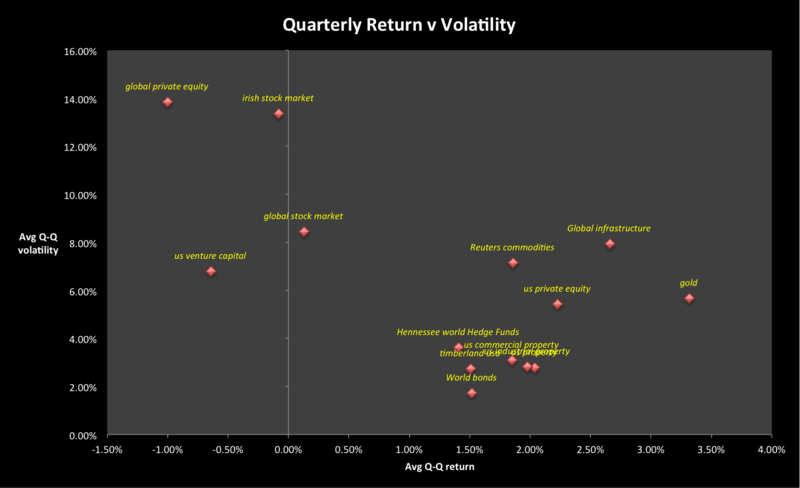 And these are not especially volatile. Irish pension funds will get increased levels of assets as the governments mandatory policies come on stream. This is good, in the long term. But it will only show the full benefit if the domestic equity focus is scrapped and a much more imaginative asset allocation policy is put in place. Irish pension funds having weathered the worst of the crisis should now look outwards. This entry was posted in Blogpost, Journalism and tagged alternatives, economy, gold, pension on September 28, 2013 by brianmlucey. 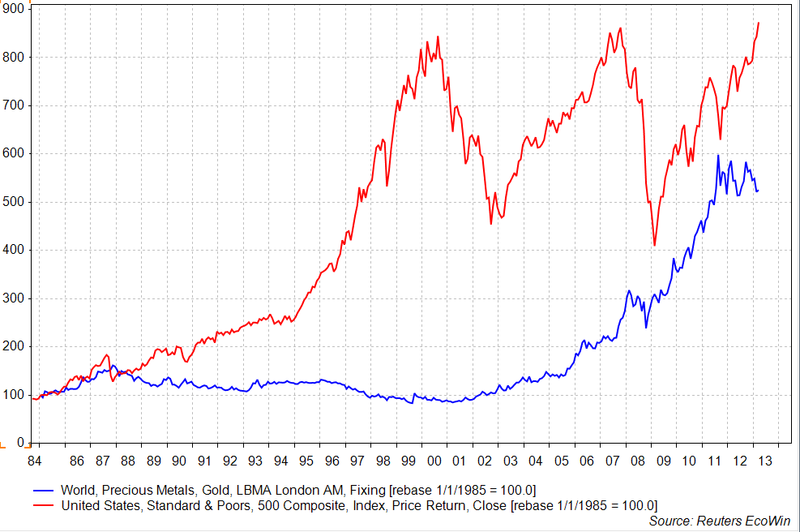 Over what periods, if any, did Gold beat the SP500 Price Index? My post on gold and the need to look at the recent falls in a longterm perspective have generated some heat and light on the twitterweb. One critique is : sure if you look at the original post it is an artefact of the timing. 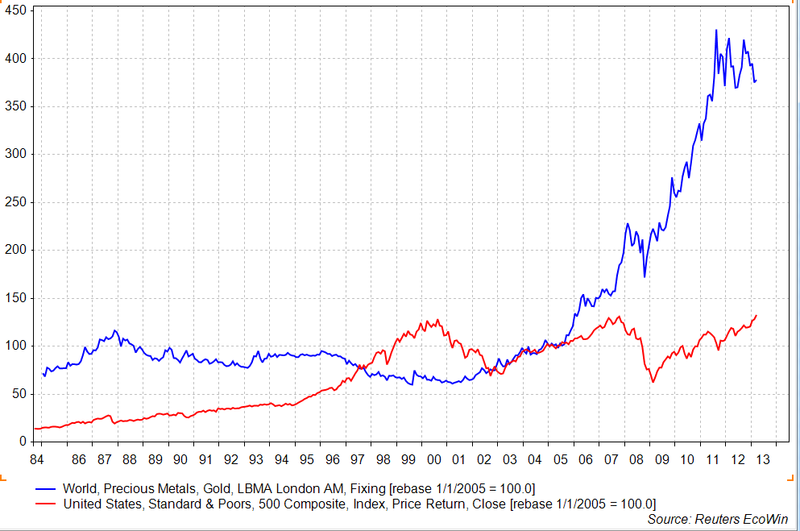 So, here are a series of charts of gold v the S&P 500 rebased at 5y intervals. 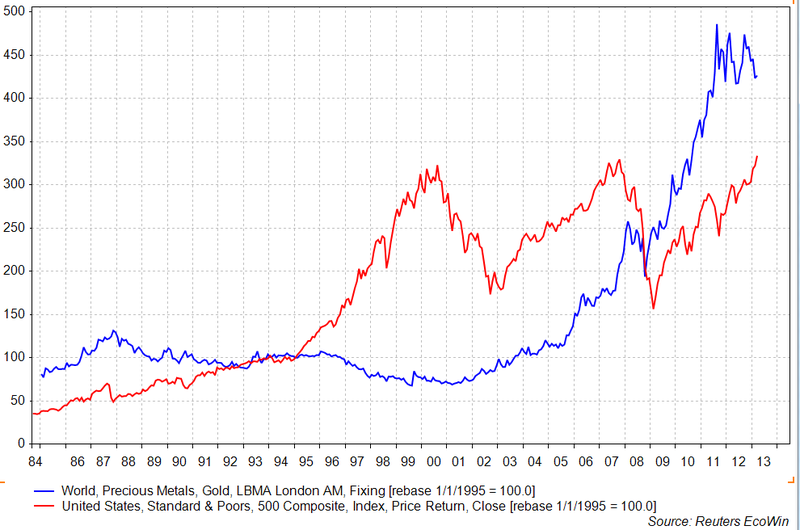 As I pointed out this shows us that a) gold has had a remarkable run over the last while and b) stocks fluctuate a lot. 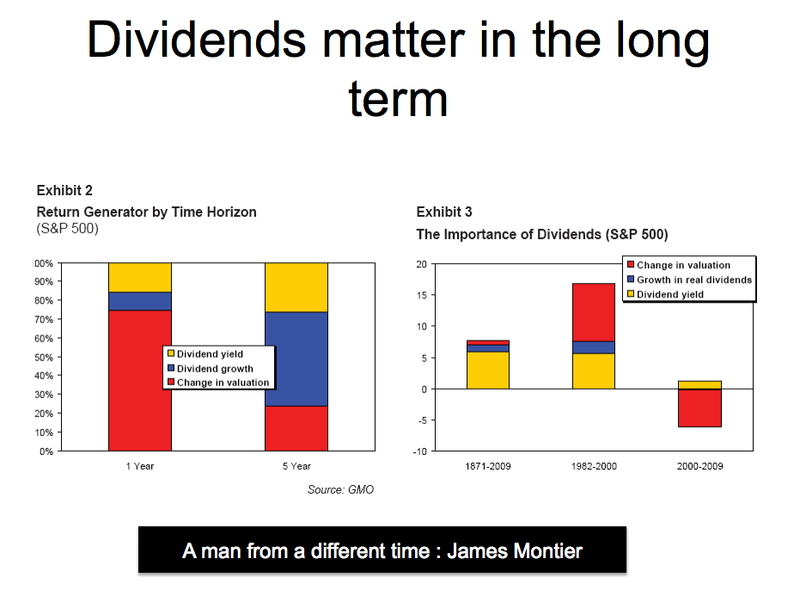 A more serious issue is that this is unfair on the equity market : although declining as a percentage of stocks, dividend paying equities, in the long term, really perform. 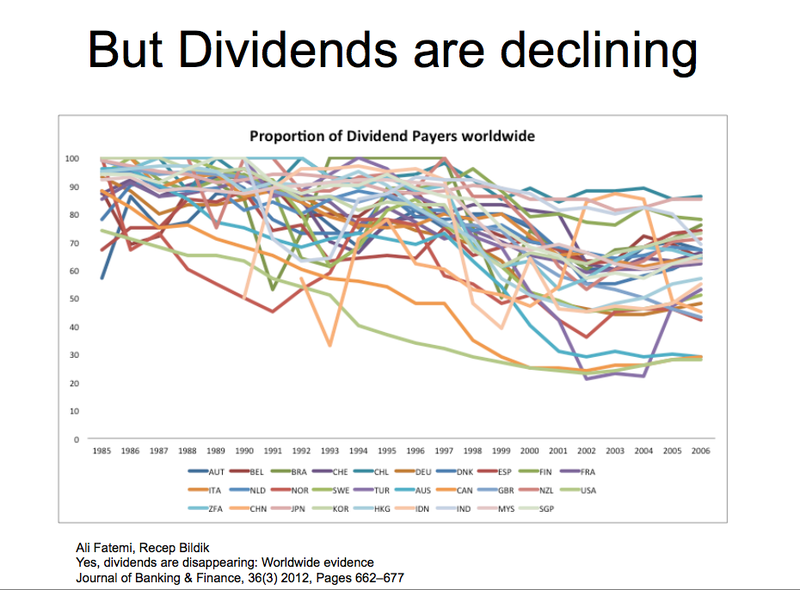 and here is some information on dividend payers worldwide. Yes, its a mess…. This entry was posted in Blogpost and tagged gold, portolio, SP500 on April 16, 2013 by brianmlucey. 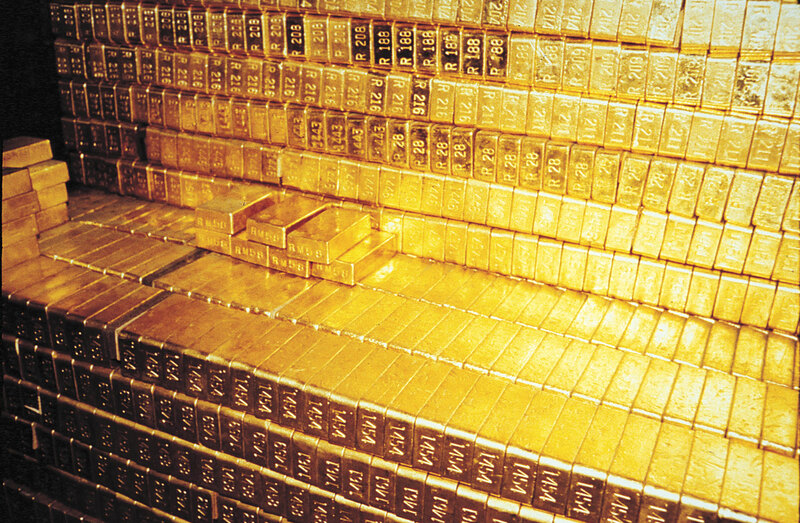 Disclosure : I do not own gold bullion or in other form. I do have a phd student part funded by the LBMA. What do or more like dont we know about Gold? Earlier this week I was at a seminar in London organized by the London Bullion Market Association. I and some others spoke. Slides, and soon I understand, podcasts, of the event are available here and comments are welcome. This entry was posted in Blogpost and tagged Academia, gold, Industry, knowledge, science on December 14, 2012 by brianmlucey. 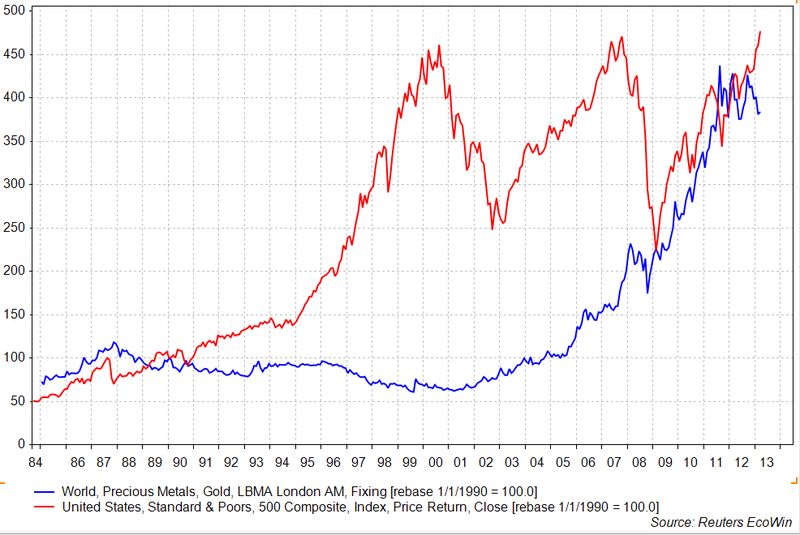 Which matters and when for gold – London or New York? This entry was posted in Blogpost and tagged gold, information, London, New York, research on November 7, 2012 by brianmlucey.